Casino Black Jack is a freeware online casino style Black Jack game. Play Black Jack for free online at Casino Games & Slots. Every time you visit Casino Games & Slots, you will get an additional 200 credits to play with. 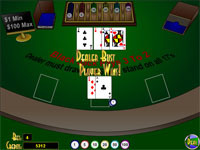 This version of Blackjack allows a player to play up to 3 hands of blackjack at the same time. 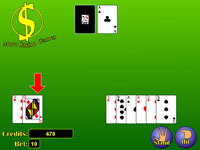 Caribbean Stud Poker is a five card poker game. Each player is dealt five cards, as well as the dealer. 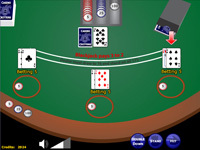 The player attempts to get a higher hand than the dealer. 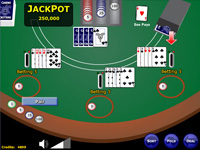 If the player's hand is higher and the dealer's hand qualifies, the player receives a payout based on the value of his hand. 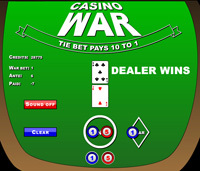 Casino War is a casino adaptation of the children's card game "War". It is a very simple game to play. A card is dealt to each and the higher card wins. Blackjack is a card game in which the player attempts to get closer to 21 than the dealer without going over. This is the original version of blackjack that appeared on Casino Games & Slots. You can play this game if you have an older version of the Flash player. ©2011 Games 4 Fun LLC. Disclaimer: The games on Casino Games & Slots are not for gambling purposes. This web site is not a gambling site, and we neither accept or pay out currency of any kind based on the outcome of any of our games. These games are also not accurate casino simulations. The strategies used in the games on this web site may or may not be effective for use in a casino.